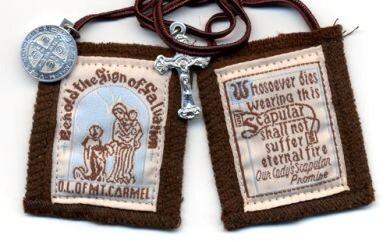 Earlier today, I renewed my Total Consecration to Jesus Through Mary that I first made on October 7, 2011. Since consecrating my life for the first time, “Mom” has taken me to places that I could never have imagined. Not only have I grown to love her more, but I’ve grown to love her Son more than I ever thought possible. The fact that a lukewarm, comfort-loving coward like me is now working full time as a Catholic Evangelist is absolute proof that Total Consecration “works”! 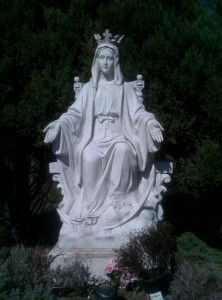 I owe everything to Mary’s intercession and I can’t begin to put my praise for Total Consecration into words. If you haven’t made your Total Consecration, you don’t know what you’re missing! Over the years, I’ve failed miserably at this. I haven’t loved souls…ALL SOULS…like Jesus does. I’ve ignored many individuals whom I’ve found difficult or annoying. I’ve turned my back on people who offended or insulted me. I haven’t shown them the mercy that Jesus has shown me. That chain in the picture above reminds me that I have a helper who will never leave my side. She will help me to love others with her Immaculate Heart and I need her help. 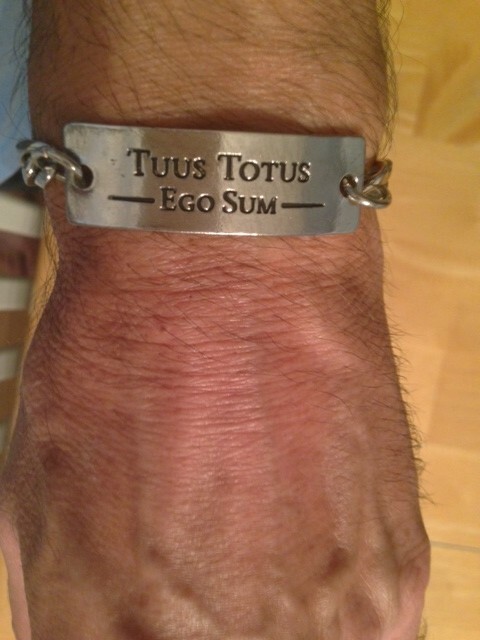 As I look at the words, “I am yours TOTALLY” that I wear around my wrist, I’m reminded of the promise that I made two years ago. It is a promise that I renew today in a formal way. Although Mary is doing most of the work, I have to trust her and listen when she speaks. I’m gonna try to get better at that…I promise! I love you, “Mom” and I’d be lost without you. I am yours…TOTALLY! 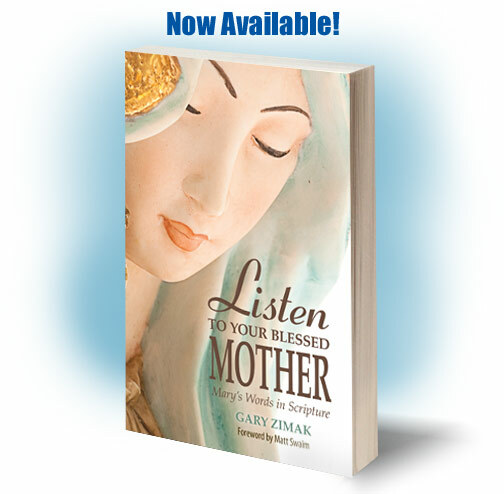 Listen To Your Blessed Mother Is Now Available! This is a big week for me. 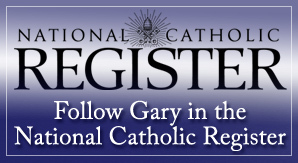 On August 7th, I’ll be heading to the Catholic Marketing Network’s annual trade show. This year the show will take place in Somerset, NJ and I’ll be joining a “who’s who” of prominent Catholic authors and personalities as we come together to showcase our latest works. It will be a big thrill to officially debut my latest book, Listen To Your Blessed Mother, and to meet many of the retailers who will be carrying the book. Some people have asked me why I felt the desire to write a book about the Blessed Mother. Aren’t there already many books about Mary? To be totally honest, although several books have been written about Our Lady, there was a void. When I searched for a book that focused on Mary’s words in Scripture, I couldn’t find one. As a result, I felt called to write it. As I started to work on the project, I made the decision to also include all of Mary’s Biblical appearances, even when her spoken words were not recorded. The end result is that through this book, you’ll learn how to “hear” the Blessed Mother speak to you through the pages of the Bible. And her message is POWERFUL! One day, God dispatched an angel named Gabriel to a city of Galilee named Nazareth. He urged her to not be afraid and assured Mary that she had found favor with God. Then he proceeded to explain the purpose of his visit, a purpose which would be enough to make most people afraid. Mary was given the details of a plan that would have her conceiving a son. That son, named Jesus, “will be called Son of the Most High, and the Lord God will give him the throne of David his father, and he will rule over the house of Jacob forever, and of his kingdom there will be no end.” (Lk 1:32-33) While you and I may look at these words and be confused as to what’s being asked, a devout Jewish girl would have known exactly what was being stated. Mary was being asked to become the mother of the Messiah! After the angel finished speaking, Mary was confused and asked a simple question – “How can this be, since I have no relations with a man?” (Lk 1:34) Some people will look at Mary’s words and wrongly conclude that her faith was weak. She’ll be compared to Zechariah who, a few verses earlier, doubted Gabriel’s prophecy about the pregnancy of his wife. Didn’t Mary and Zechariah both doubt the angel’s message? Not at all. Mary believed and Zechariah doubted. How do I know, you might ask? The answer lies in Gabriel’s reaction. After Zechariah’s question, the angel stated that he “didn’t believe his words” (Lk 1:20). Mary received no such rebuke because, unlike Zechariah, she was simply asking for details. Sometimes we lose sight of the fact that, although Mary was sinless, she was still human. Being chosen to become the mother of God didn’t automatically give her all the answers. Like us, there were times when Mary had questions about God’s will. Even though she always wanted to follow the Lord’s plan for her life, she was sometimes confused and needed to discern His will. 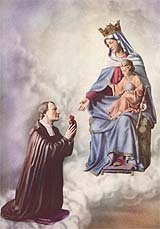 As for Our Lady’s question to the angel, some background is necessary in order to understand what she is asking. 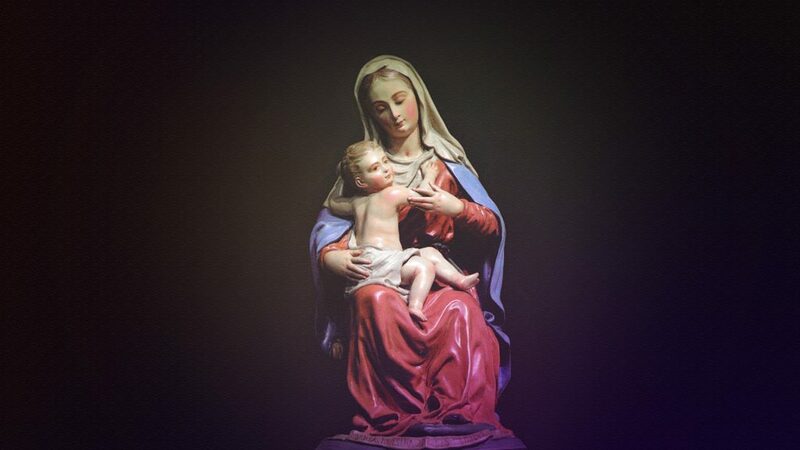 The common belief of many theologians throughout the years (including Blessed Pope John Paul II, St. Augustine and St. Gregory of Nyssa) is that Mary was confused because she had consecrated her virginity to the Lord. Although unusual for married people, this practice was not unheard of in Mary’s time. This theory is supported by looking at Gabriel’s words. He told Mary that she would conceive and bear a son named Jesus. He didn’t say when, only that it would happen at some point in time. Since Mary was engaged to Joseph, it would be expected that she’d bear his children, therefore there’s nothing unusual about the message…unless she vowed to remain a virgin. Always desiring to do what’s right, Mary made a decision to do what she thought was best, but then Gabriel appeared with some new information. When informed that God wanted her to have a child, Mary needed to reevaluate her plan. Wanting to fulfill the will of God in her life, she needed to ask the important question. How can this be? Please tell me the details so I can cooperate with God’s plan. Far from doubting, Our Lady was pondering Gabriel’s astonishing message and was asking for guidance in carrying out God’s will. The Message: God has a plan for my life and wants to make it known to me. Through prayer and careful listening, I can become aware of that plan and put it into action. PREORDER NOW AT A 20 % DISCOUNT!!! Coming Soon…Listen To Your Blessed Mother! 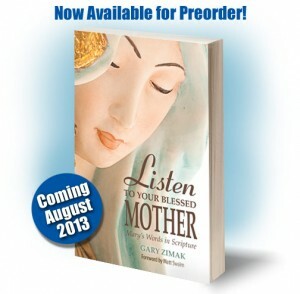 I’m excited to officially announce my second book, Listen To Your Blessed Mother (Mary’s Words In Scripture). Coming in August 2013 from Liguori Publications, it will be a reflection on Mary’s words in the Bible. Matt Swaim, author and producer of EWTN Radio’s Son Rise Morning Show, has graciously agreed to write the foreword. This book has been a labor of love and I’m anxious to share my thoughts on my Blessed Mother with you. 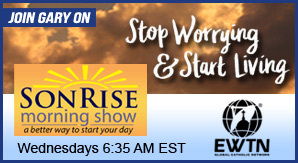 The idea started when I did a series of blog posts and segments on The Son Rise Morning Show. When we listen to Mary’s words and observe her actions, we can learn more about our Faith than from a library full of books. I can personally attest to the fact that the more we love Mary, the more we will love Jesus. I’d appreciate it if you’d keep this project in your prayers and help me to spread the word. I’ll provide more details as soon as I can. As you may be aware, on September 4th I began leading 880 people as we prepare for Total Consecration to Jesus through Mary on October 7th. 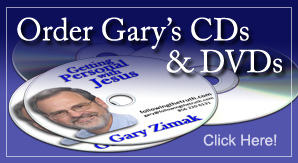 Using my daily radio show on BlogTalkRadio, I’ve been reading and explaining the preparation prayers and meditations. On Saturday, we completed the first stage of the journey – 12 days spent trying to rid ourselves of the spirit of the world. In an attempt to summarize our accomplishments, I sent the following email message to all participants. If you’re interested in learning more about this great devotion, please email Me . I guarantee it will change your life! We have completed the first phase of the process. It’s important to remember that the first 12 days of Preparation for Total Consecration are designed to help rid ourselves of the spirit of the world. More accurately, they are designed to help us recognize the influence that the world has over us. It will probably take a lot more than 12 days to completely rid ourselves of the world’s influence, but this period is certainly a start. What have we accomplished? Here are some questions that should make you think. They represent some of the lessons that we should have learned in the first 12 days. Are you aware that you have been called to holiness? Did you dedicate a firm amount of time to spend on the exercises each day? Have you decided on an act of sacrifice for the remainder of the preparation period? What are the excuses that you make for not responding to God’s will? Do you boldly proclaim the truth of the Catholic Faith or do you sometimes hold back, choosing the path of least resistance? Do your external religious practices match your interior devotions or are you sometimes hypocritical? What is your most common temptation and how do you fight against it? Have you decided when you will go to Confession during the preparation period? Which of Mary’s virtues have you chosen to imitate? Have you identified a persistent sin in your life that you are not fighting against? Why not? How can you better participate in Mass on Sunday? In your daily life, how can you become a light in the darkness? If you think you could have done better during the initial period, don’t panic. Instead, be thankful that you are aware of your shortcoming and use this knowledge to try to do better in the next phase. Be aware that the evil one doesn’t want you to complete this process and will do everything in his power to get you to quit. One of his favorite ways is to make you think that you’re not doing a good job. DON’T FALL FOR IT!!! May God bless each of you as you continue on the journey which will bring you closer to Him! Let me know if I can be of service to you. 1. 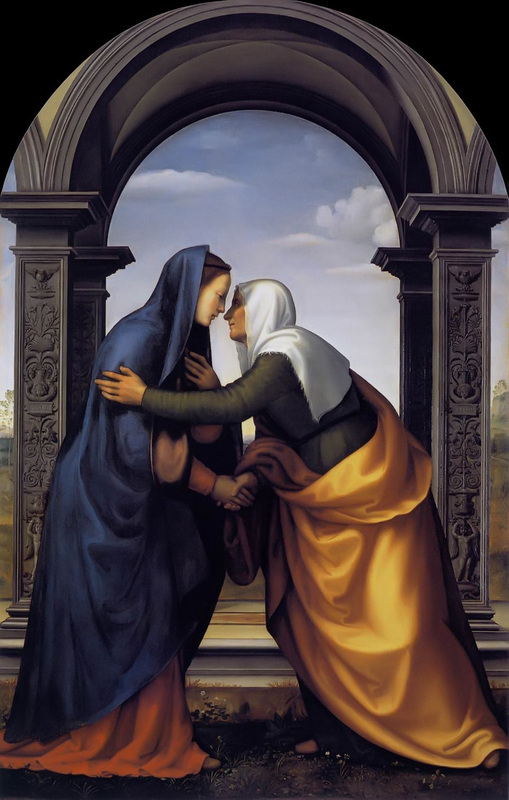 Mary’s Humility – The humility of the Blessed Mother can be seen in her response to Elizabeth’s words of praise. Instead of accepting the compliments and taking full credit for her “being blessed”, Mary instead praises the Lord. She knows that God is the source of her goodness. That is TRUE humility! 2. Mary’s Gratitude – The words of Mary’s prayer illustrate her gratitude to Almighty God. Beginning with the initial proclamation of joy for her salvation (Mary needed a savior, but as written by Pope Pius IX in Ineffabilis Deus, she was saved “by a unique gift of grace and privilege of Almighty God, in view of the merits of Christ”), we see someone who is very grateful for God’s unmerited gift. Basing her remaining words on the Song of Hannah (1 Sam 2:1-10) and other Old Testament passages, Mary uses her knowledge of Scripture to express a deep appreciation for the Lord’s benevolence. 3. Mary’s Love For Her Neighbor – As soon as Mary discovered that Elizabeth was pregnant, she went “with haste” (Lk 1:39) to visit her. Not worrying about the inconvenience that goes along with being pregnant and traveling to the hill country, Mary put the needs of Elizabeth ahead of her own comfort. As a further example of her concern for the well being of others, Mary stayed with her elderly relative for 3 months (Lk 1:56) before returning home. When one considers what was going on in her own life, Mary’s actions provide us with a tremendous example of what it means to “love thy neighbor” without counting the cost. 4. 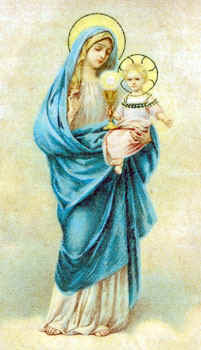 Mary’s Faith – Giving us further scriptural proof that Mary embraced and believed the incredulous words of Gabriel, Elizabeth proclaimed “Blessed are you who believed that what was spoken to you by the Lord would be fulfilled.” (Luke 1:45) In his book The Glories Of Mary, Saint Alphonsus Liguori stated that “it was as a tribute to her faith that Elizabeth called Our Lady blessed.” Mary trusted fully in God and did whatever He asked, thus giving credibility to her words, “Behold, I am the handmaid of the Lord”! 5. Mary’s Obedience – Although some people are disturbed by the term “fear of the Lord”, Mary understands the true meaning of the concept. When she states “His mercy is from age to age to those who fear Him”, the Blessed Mother acknowledges the importance of obeying God’s commandments as an expression of love! Those who truly love the Lord have a fear of being separated from Him or letting Him down. That desire to please Him results in obedience. According to Archbishop Fulton Sheen, obedience “springs from the love of an order and of Him who gave it…Obedience is servility only to those who have not understood the spontaneity of love.” (The World’s First Love) Mary reminds us that we should obey the Lord because we love Him and don’t want to disappoint Him! As we read through the words of Mary’s Magnificat, we see a heartfelt profession of faith from someone who was grateful for God’s mercy and providence in her life. Too often, we take the Lord’s mercy for granted and don’t trust in His providence. May our Blessed Mother intercede for us and help us to love God with all our hearts and truly “rejoice in Jesus Christ, Our Savior”!